The start of last night’s GFS twilight was a bit chaotic, about 7 boats (us included) seemed to have exactly the same idea as to the best starting procedure. We all wanted the same bit of the start line at the same time! There were at least 3 boats that we could have protested and I suspect about as many that could have protested us, but in the light winds and limited room to manoeuvre it was mutual self survival, there was no shouting just people getting on trying to stay out of other peoples way, fortunately the start remained non contact, a couple of boats were able to stay out of the melee and benefited with big leads through Humbug. We ended up at the back of the field, the trimmers worked hard to give us a bit more speed on the reach across to Cockatoo Island and by the time we turned down wind to run along the southern shore of the Island we were in a position to get to windward of the fleet. 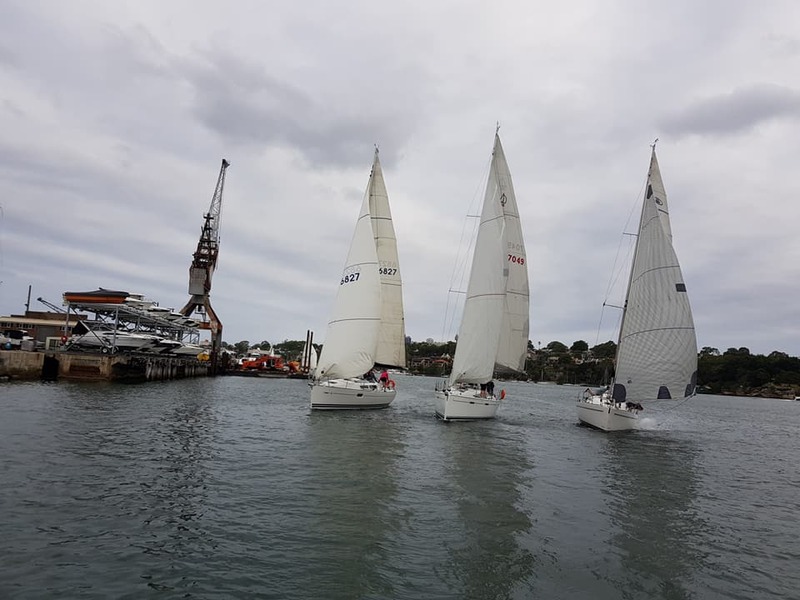 The pressure was a bit stronger a bit further out and we were gathering in the fleet, by the time we rounded the south eastern corner we had climbed to fourth and were make good time on third place. We had just gybed onto a starboard and as I looked behind to make sure we had room to come up on the boats behind I saw something that I never wish to see again. The crew on one of our competitors boats were changing position, probably in preparation for a gybe when they accidentally gybed, two of their crew were hit by the boom, the noise was astonishingly loud (sickeningly so), one of the victims just slumped to the deck, while the second went over board and hit the water motionless (the splash can be seen off Sirocco’s port side in the incredible photo below). A third noticed the that the crew member in the water was not moving and dived in to assist, fortunately the first in quickly regained consciousness and started a slow swim, but there were now two people in the water, and the crew of the boat were tending the first victim on board. We hailed them asking if they required assistance to which they quickly answered in the affirmative. L to R Takana, Saoirse and Sirocco at the the moment of MOB from Sirocco , incredible photo by Jeff Lewis. We quickly dropped the head sail and luffed the main, started the engine and put our selves in a position to retrieve the swimmers. Those familiar with the Elan 340 will know that it has a high transom that makes it extremely difficult to board without assistance, (The picture below does not illustrate that height as it was taken in fairly rough water while we were exceeding 8 knots on a broad reach, in these circumstances she tends to bury her bum – it’s the only photo I can find of the subject safety gear) the swim ladder is not a permanent fixture and lives in a cockpit lazarette, we have an emergency rope ladder that hangs unobtrusively from the stern pushpit, we deployed that ladder and were able to position the boat so that the suspected injured swimmer could grab and hold on, a lifesling was thrown to the second swimmer. The guy hanging onto the ladder was unable to climb it, made even more difficult by me having to keep the boat moving to avoid colliding with the rock wall of Cockatoo Island. We were able to collect and fit the swim ladder, swing the victim from the rope ladder to the swim ladder and get him on board. Quickly followed by the second swimmer. Even though it was quite a balmy evening, these guys were really cold and I suspect out of embarrassment or a bit of shock were reluctant to accept any form of assistance. Fortunately the girls in our crew were able to at least get wet jackets off them and wrap them in dry towels. The safety gear used to good effect last evening. The upshot was that the two crew that were hit with the boom were in pretty good shape, at least one of them was taken to hospital as a precaution while the second, the one we picked up was apparently showing no ill effects for his adventure, I hope he got himself checked out though. 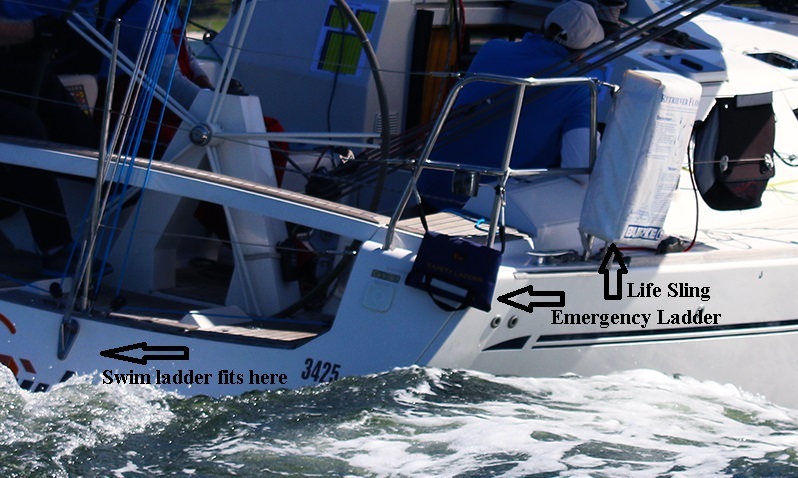 I am now glad that we always set up the lifesling and emergency ladder whenever we go out, I have often thought why do I do this and maybe in the benign waters in the harbour we can go without these safety bits, never again will I think that. I was also glad to have had a bit of training in Man Over Board, while this was the first time I have had to use it, it did demonstrate to me just how hard it can be to get an exhausted, but conscious person back on board, I hope I never have to deal with an unconscious one. By the time we got back to the Deck of Knowledge for our meal we were informed that a decision had already been made to award us our average point score as redress.